This is about Kennedy’s performance in Some Came Running (1958), directed by Vincente Minnelli. Kennedy scored his fourth Best Supporting Actor nomination for his portrayal of Frank Hirsh, the embodiment of small-town small-mindedness and hypocrisy. 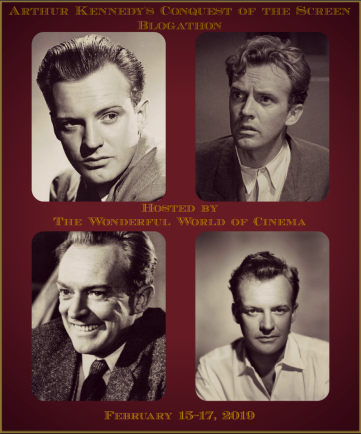 I am thrilled to be writing this as part of the Arthur Kennedy’s Conquest of the Screen Blogathon, hosted by Virginie at Wonderful World of Cinema, and today is Kennedy’s 105th birthday, which makes the celebrating all the sweeter. 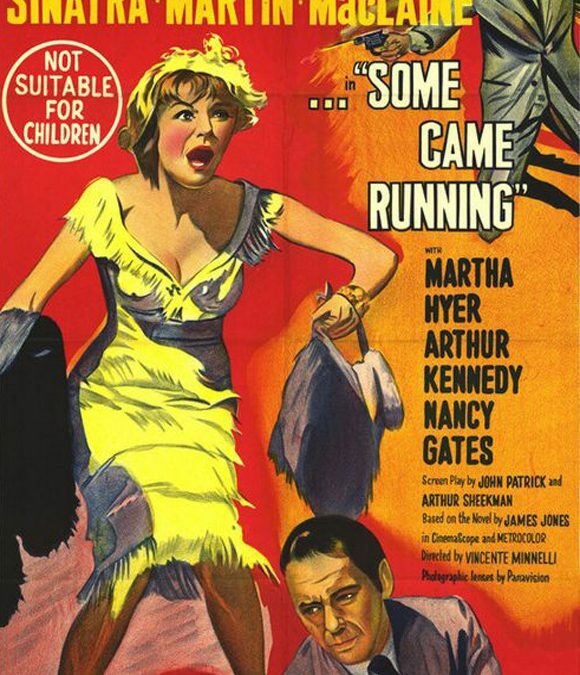 Some Came Running was adapted from James Jones’s second novel. The first Hollywood adaptation of Jones, From Here to Eternity (1953), had been the vehicle for Sinatra’s comeback, and had won him a Best Supporting Actor Oscar. Minnelli writes a little bit about it in his memoir, I Remember It Well, but he doesn’t mention Kennedy. If you’re not familiar with the movie and want a plot synopsis, here you go. I’m going to look at the movie, its themes, and how Kennedy’s character Frank fit into the bigger picture. Some Came Running was Jones’s sophomore effort, and it took him seven years and 1,200 pages to say what he felt needed to be said. Minnelli writes that some critics felt the book was unfocused and lacked strong themes. Jones told Minnelli that the book’s basic theme is the failure of people to ultimately connect, and how much more people want to be loved than they want to love. Its protagonist, Dave Hirsh (Sinatra), finds himself in his hometown, Parkman, Indiana, with a wicked hangover and no memory of getting there. The book is set in 1948, and Dave is still wearing his army uniform. He is a writer, but Minnelli makes it clear that Dave doesn’t feel good about himself or his work. He says he’s quit writing. Minnelli makes it clear why Dave is so lost: older brother Frank, a wheel in the small town who owns a jewelry shop, is on the board of directors at a local bank, and is on the local planning commission, sent 12-year-old Dave to a boys’ home when he married his well-to-do wife, Agnes. Dave doesn’t even know if their father is alive or dead. It’s easy to believe that with a complete lack of family and the betrayal of being sent away to fend for himself, Dave doesn’t have much in the way of relationship skills beyond card games and bars. He’s intelligent and talented, but he feels so unwanted, such an outsider, that though he knows it was Frank who jettisoned him, that it had nothing to do with him, he’s, to use one of my favorite phrases for describing such characters, all twisted up inside. He has no reference for feeling loved, so he will need a lot of help learning to give and receive it. Frank is not the guy who can provide it. Frank is as messed up as Dave, though he would protest mightily if he heard me say it. After all, he’s a pillar of the community, a successful local businessman, married for the past 18 years to Agnes, who is as superficial and materialistic as he is (so they’re well suited). While Dave doesn’t pretend to be anything he’s not, so authenticity is one thing he won’t have to learn, Frank has made his way in little Parkman by acting the part of the guy who belongs. He will do anything to preserve what he’s got, and Dave’s showing up in town terrifies him. He’s afraid Dave is going to show him up for the utterly phony and emotionally and spiritually bankrupt empty suit he is. Frank is a little sweaty, always afraid, always watching for an opportunity or imagined danger. This is a classic Kennedy portrayal of an unsympathetic character. Kennedy could play any kind of man, from a hero to villain, and all points between. His honesty allows him to construct an unpleasant man like Frank?vain, self-pitying, self-involved, always on the make, unable to feel any remorse for abandoning Dave or to offer him any honest way to rebuild their relationship. Frank Hirsh is almost as despicable as a character Kennedy played the previous year, in 1957?Lucas Cross, in Peyton Place. Cross is as vile as any villain who ever fouled the screen, and while Frank Hirsh’s inability to love and obsessive need for approval are normal human failings intensified for dramatic effect, it’s surprising that given Lucas’s life of domestic violence and sexual abuse, Frank almost matches him for loathsomeness. We know that no shading of human behavior was outside Kennedy’s range. I admire him for playing these rotten characters balls-out, and not asking us to like them. He gives them the dignity of playing them straight, not prettying them up. Lucas is a monster, unredeemable. Frank doesn’t suggest any possibility that he can change. His lack of self-awareness is so monumental, it’s kind of impressive. But I do pity him. To Frank, Dave is merely a threat to be managed. Frank and Agnes never really rest. All their energy goes into managing appearances, faking emotions, and avoiding bad press. Dave has Frank’s number, but to his credit he is able to relate to Frank’s daughter, Dawn, as a fond, protective uncle. When, inevitably, Frank and Agnes’s dishonest life leads to a family crisis that threatens their daughter and their spotless reputation among Parkman’s wealthy, it’s Dave who steps in to offer Dawn the benefit of his experience, and a way out of the inevitable false step that so many mixed-up girls in ’50s movies seem all too ready to tumble into. She avoids that, thanks to Dave, but still follows through on the sidestep such movie teen girls make: She leaves Parkman and goes to New York City, just like her spiritual sisters in Picnic and Peyton Place.? Frank is loathsome. I wonder if the writers considered making him a little less so, perhaps softening him slightly toward the end of the movie. But it’s an honest choice to depict him this way. There are people like Frank, who when they have left tire marks on your back, have the nerve to ask you to feel sorry for how bad they feel as they pull the knife from your back. Anyway, Kennedy isn’t the only morally compromised character in Some Came Running, but as Dave’s big brother he carries a lot of the story’s weight. Other characters have their own limitations. Gwen (Martha Hyer) is massively conflicted about her feelings for Dave, and ‘Bama (Dean Martin), Dave’s gambler friend, breaks with him when he decides to marry Ginny (Shirley Maclaine), whom he calls a “pig.” Ginny, the girl who followed Dave to Parkman from Chicago, is the only person in the story who is able to love unabashedly. That is, it’s messed up that she loves Dave, who is only nice to her when he’s drunk, but her love is unconditional, something Dave has never before experienced, and he wants to allow her to love him even if they’re poorly matched in just about every way. There’s a chaotic quality to this movie, perfectly expressed in its final bravura sequence, which Martin Scorsese highlights in a TCM featurette about CinemaScope. A fair at night, all brightly colored lights, noise, and chaos. It’s as if Dave’s emotional confusion has finally exploded, and it doesn’t end well. One more thing: Some Came Running is about gamblers, drunks, small-time hoods, and their more respectable opposites. It’s squalid, and Minnelli found the bars and louche characters intriguing. It’s another reminder that even in the ’50s, a decade before Bonnie and Clyde was said to have been the final nail in the Production Code’s coffin, directors continued to pick away at the Code. Ginny isn’t exactly a prostitute, but she is called “tramp” and “pig.” ‘Bama is a gambler, living at the edge of the law, but he still feels morally superior to Ginny. Frank tries hard to convince himself of his own virtue, but his frustration and let’s just say it, horniness almost destroys his carefully cultivated life?his, not any of the shame he so operatically fears Dave will bring upon him. A question: In this tiny town, where everybody knows everybody else’s business, isn’t it a little strange that people don’t remember Frank sending Dave off to the home? And those who knew Dave when he was a kid, like Connie Gilchrist in a terrific small part?wouldn’t they perhaps bear Frank a little ill will for throwing his brother away so his ascent wouldn’t be dragged by caring for his only living relative? Here’s two of Kennedy’s early scenes with Sinatra. They lay out the relationship dynamic and let viewers get to know Frank, his sad, dishonest way of life, and how emotionally barren he is. Frank, pushing open the hotel room door: Dave? Dave, shaving at the mirror: C’mon in. Frank: How’d you know it was me? Dave: I figured it’d be you. Frank, extending his hand: Dave, you old son of a gun, welcome home. [Forcefully pats Dave’s shoulder] Oh it’s good to see you, boy. ? It’s been a long time. Frank: Oh, you dog you, 16 years and not even a postcard. Dave: I didn’t think you’d worry about me. Frank, trying again: Oh?you’re looking fine, Dave. ? Oh, I know, I know, [fiddles with his hair] it’s getting a little thin on top. But like they say, not much grass on a busy street. Dave: You may be losing your hair, but you haven’t lost your razor-sharp wit. You want a drink? Frank: At 10:30 in the morning? Dave: I don’t watch a clock. Frank [chuckles mirthlessly]: What ever happened to your writing? When we used to see your name in print, at least we knew you were alive. Dave: I gave it up. Frank: Why? We heard you were doing pretty good, you got some? Dave [interrupting]: The old man still alive? Frank: Oh, oh?you didn’t know. No, no, God rest his soul, he passed on four or five years ago. Towards the end, Dave, he was just hell on wheels. Dave: Tchew, what a family? Frank: Oh, wait till you see the new generation, Dave, why that niece of yours is a real lady. ? Say, why don’t you pack up and move out to the house, huh? We got plenty of room? [Dave regards him] Well, I’m pretty sure we have. Dave: No thanks, Frank. I’m okay right here. Frank: Well then let me call Agnes and have her get a?a fatted calf out of the deep freeze. You’re gonna have dinner with us tonight, Dave, you know that, don’tcha? Dave: Sorry, Frank, I got plans. Frank: Oh. Uh, well, what are your plans, Davie? Uh, what made you decide to come back to Parkman? Dave: Cause I shot my big fat mouth off to a couple of drunken friends of mine and told them where I was born. Frank [slightly defensive]: Well, what’s wrong with that? Parkman is your home? Dave shoots him a look. Dave: How’d you know I was here? Frank: Practically everybody in town knew you were here?before I did. [aggrievedly, again] You might have called me, Dave. You owe me that much. Dave: No, I owe you more than that. Four hundred and ten dollars, to be exact, I’ve got the check all made out. Dave: This little check represents room and board for Mrs. Dillman’s home for little boys. Three dollars and fifty cents a week from the time I was about 12 until I read a travel folder. Frank: You can’t still be brooding about that. Dave: I’m not brooding, I’m grateful. I was a little better off than most of the kids. I had a generous big brother. I was what they called a semi-charity boy. Frank, jumping out of his chair: What the devil’d you expect me to do, have the whole family move in with me? You knew I had just married Agnes. Frank: Good Lord, Dave, you’re a man now. You know that a man has to live his own life. Dave: How is Agnes, Frank? Frank: Oh?Davie, I did what I thought was right. Nobody can do any more than that. Sure it was tough on you, but how do you think I felt, putting you in the home, my only brother? I’m not made of wood, Dave. [theatrically] If you only knew the nights I couldn’t sleep. Dave smiles maliciously: Your story moves me to tears. Take the check, c’mon? Frank protests, then takes the check: Oh all right, if it’ll make you feel any better. I’m not gonna fight with you, Dave. Life’s too short for that. Say, why don’t you have dinner with us, I’d like it very much. ?Not that it’ll look funny if you didn’t, you know, but?will you do it? Frank: You mean, you’ll come? Dave: If you’re sure Agnes won’t throw up. I’m not her favorite relative. Frank: Ohhhhh, what talk. Uh, meet me at the store, say, at 5, and I’ll call Agnes and have her fix something real special. [pats Dave on the shoulder again, all brisk and manly, reaches for the doorknob, then stops, chuckles to himself] Uh, Davie, about that little gag of yours of putting your dough in the other bank, and all that? Dave: I thought it would break you up. Frank [opens the door]: See you at 5. Frank enters, sighs heavily: If you could just see yourself. Dave: And a good morning to you, sir. Frank, sarcastically: That was nice going, Dave, I’m real proud of you. One day in town, just one day, and you’re picked up in a drunken brawl with a floozy and tossed in jail?like a common hoodlum. Dave: I know all about it. Frank [pacing]: I just don’t understand you. Dave: Is that your problem for this morning? Frank, putting his hand over his heart: What have you got against me? Frank: Oh, yes you have. I take you to my home, I introduce you to the best people in town, like the Frenches, and this is the thanks I get. You seem to resent my position. It’s no crime to be successful. I’ve worked hard for everything I’ve got. Nobody’s helped me. Dave: Is this gonna be another one of those long lectures? Frank: Oh, I might have known?. Dave: Frank, I’m not trying to needle you, I don’t feel well. I got a headache, and I have to be in court. Frank: You won’t have to be in court, I’ve squared it. And that mobster friend of yours has already skipped town. You both forfeit bail. Frank: I didn’t do it for you, Dave. I’m raising a decent girl [however, it is Frank who presents the moral hazard to his daughter, not her Uncle Dave]. Dave: That she is. She’s a fine girl. Frank: And I’ve told the judge you’ll be leaving town. Dave [pauses]: Did you tell him where I was going? Frank, raising his voice: How do I know where you’re going? Dave: How did you know I was leaving? Dave [pauses]: Yeah, I guess so. Frank, aggrievedly: I wish I could say I was sorry, Dave. Dave: I wish you could say so, too. Frank: Well, I suppose it will be in all the afternoon papers. That’s all I need. Just when my name was beginning to amount to something. ? How could you do this to me? Dave: Me, me, me, me! Don’t you ever get tired thinking about your dull, greedy, small self? [Frank does not reply] Now get out of here, I’m tired of listening to you, get the hell out of here. This was written for the Arthur Kennedy Conquest of the Screen blogathon, hosted by The Wonderful World of Cinema. Go on over and read about more of his work. A great and thoughtful article Lesley! I especially agree when you said ” He gives them the dignity of playing them straight, not prettying them up.” when talking about Arthur Kennedy’s controversial roles in this film and Peyton Place. I saw this film only once and that was in my seminar on American Cinema of the 50s, so I have to thank my teacher for making me discover it! I remember enjoying it but your review really refreshed my memory on some aspects. Thanks so much for your participation to the blogathon! Thank you so much, Virginie, I wrote it in haste and had a lot of thoughts afterward I wish I could have included. It’s not a pleasant movie in a lot of ways, and Minnelli’s interest in the seedy environs, the bars and backroom card games, is so far from the beautiful dream world of his musicals. I like that he wasn’t content to stay in the pastry shop and wanted to explore darker themes. It was a pleasure to participate in the blogathon. I totally agree with you that Kennedy deserves more attention, and good on you for getting him some! I’ve watched Some Came Running many years ago, and your review refreshed my memory and made me want to see it again, now focusing more on Frank. By the way, we all know some Franks in our real lives, don’t we? Thank you kindly, Le, glad you liked it! If I didn’t comment on your post, which I enjoyed, it’s because sometimes I’m not allowed to comment, some glitch and very frustrating!